I'd like to request a change in the site to replace all instances of "MOD" with "mod" or "Mod". 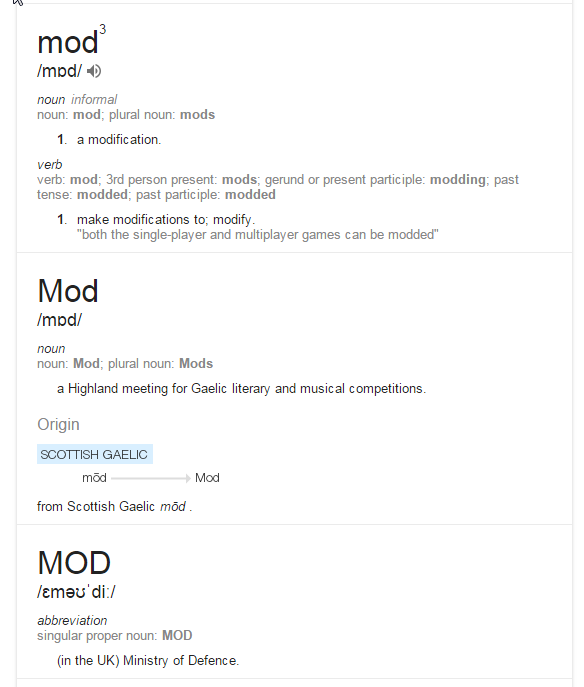 "Mod" is a shortening of the word modification. Thus it's written as either "mod" or "Mod". "MOD" is defined as "Ministery of Defense". You can check definitions here. Needless to say, not only does MODs sound like something written by a person who struggled to finish primary school, but also sounds like screaming and is specially annoying to read inside sentences. I hope you do something to address this issue. Thanks for your feedback. The shortening of Modifications to MODs instead of Mods was done because we also have a Moderator team, as do most forums in existence regardless of the forum software in use. This makes a clearer distinction between the two since the term "Mods" is more generally accepted in the forum world to refer to Moderators. Shouldn't it be rather obvious given a context though? - Mods like to drink coffee. - I have downloaded a lot of mods for my site. - Need help installing this mod. - That nazi mod banned me. - That mod's version is 3.5.1! - One of the mods stole my bike. Even if there was a food named mod, we still wouldn't have this issue. "I just had a few mods for breakfast" or "Mom please get me some mods from the supermarket" or "I pooped mostly mod leftovers". Context can help, sure, but a clear distinction between the two was preferred at the time the use of this abbreviation was decided. This term has been in use for over 10 years now and is plastered across many different websites on the internet so changing it now would provide no benefit and would only serve to somewhat confuse things. Plus we are moving on from MODs to Extensions anyways beginning in 3.1 so there is even less benefit in changing it at all. We are obviously planning to let the term die out with 3.0. El Fantasma de la B wrote: Thank you for your response. - Can we get a mod to do that? - That mod is good! macr.ae = my website. you probably won't like it. El Fantasma de la B wrote: Shouldn't it be rather obvious given a context though? user then sits around waiting for a moderator to respond when in fact they need a modification to do the job. Then user is really stupid. In both cases its very obvious that it refers to a modification and not a mod. And when in doubt you should always pick modification because 'modification' in form of a release or project is in most cases refered as 'mod', while 'moderator' is in most cases refered as 'moderator', such as in any forum's legend or rank. But we're dealing with everyone from people who have built their own servers to people who have inherited sites and have not got the first clue what they're doing and have barely even worked out that phpBB is the name of the software. El Fantasma de la B wrote: Then user is really stupid. Why does it even matter? Nobody else has had a problem with MODs. Language is a tool, not law. good grief, get a life! who died and made you grammar god all of a sudden? doing it this way makes perfectly good sense to everyone but you apparently. does that tell you something? it should. it tells me that you have way too much time on your hands and not nearly enough important things to think about. The guy with 55k posts said I don't have a life. Thanks for the explanation. I will now be writing is capslock and bold so that people don't confuse me with admins. Because it isn't obvious that i'm not an admin if you don't check my username, avatar and rank. Some people are new to these forums and might not know this so from now on when you see a post in capslock it's mine. I hope there is no issue with my new ways because lumpy burgervirgin implied i made this thread because i'm a grammar god and not because capitalized words sound like screaming. Thank you and greetings. Last edited by Jessica on Thu Jan 22, 2015 3:58 pm, edited 1 time in total. For someone who appears to like precision in grammar/spelling could you please use the correct plural of forum in future. This topic has ran its course and there really isn't much discussion to be had. Therefore I'm locking it. Please don't contact me via PM or email for phpBB support . Post-mortem: the term MOD/MODs is a brand name at this point, not an abbreviation, for Modifications. The argument of it being incorrectly used because of grammar does not apply in this case.